A person might use a leather jacket, combat boots, and a scowl to say “don’t mess with me.” A timid South American woodpecker uses the same general strategy, though different accessories, to look like bigger, tougher birds. 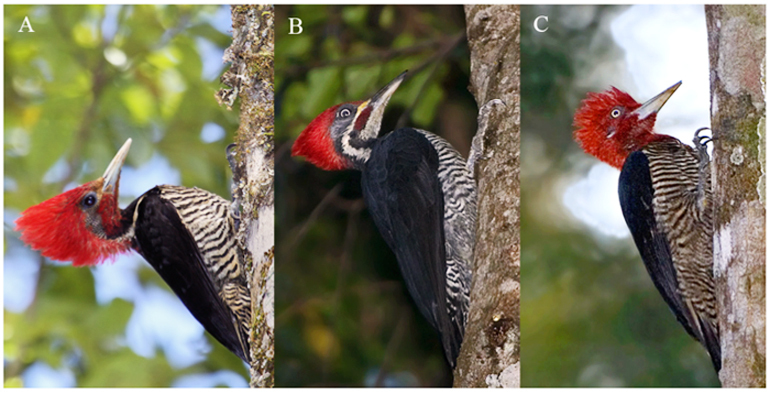 Visual mimicry lets the helmeted woodpecker (Dryocopus galeatus) live on the threatened Atlantic forest turf of two bigger birds—the lineated Dryocopus lineatus and robust (Campephilus robustus) woodpeckers—reducing the likelihood of being displaced in an area of foraging. “Because of this, it has the advantage of foraging in the same areas as the birds it’s mimicking, with those birds not being aggressive to this smaller woodpecker,” says Mark Robbins, ornithology collection manager with the University of Kansas Biodiversity Institute. Robbins is coauthor of a forthcoming paper in The Auk: Ornithological Advances showing that the helmeted woodpecker has tricked competing woodpeckers as well as previous generation of ornithologists who misclassified the bird based on the appearance of its plumage. One of Robbins’ initial suspicions that the helmeted woodpecker wasn’t a close relative of the lineated woodpecker came in 2010 at an international conference of ornithologists in São Paulo, Brazil. Next, Robbins teamed with two colleagues, University of Kansas alumnus Brett Benz of the American Museum of Natural History (lead author on the Auk paper) and Kevin Zimmer of the Los Angeles County Museum. They sought a deeper understanding of the helmeted woodpecker, so they conducted genetic analysis of the bird. The question was whether the helmeted woodpecker belonged in the genus Dryocopus, as the bird’s appearance would have it, or if a look at the woodpecker’s DNA would place it more appropriately in genus Celeus. “Background genetic work on placement of this bird was performed using tissue from toe pads from specimens at the LA County museum that had been collected over 60 years ago,” Robbins says. Without modern genetic analysis, the helmeted woodpecker’s evolutionary strategy of mimicking competing birds would have been hidden to science. “Only in last 15 years or so could this have been revealed,” Robbins says. However, Robbins says that intense farming within the threatened Atlantic Forest habitat of the helmeted woodpecker has put survival of the species into question. He hopes the discovery of the bird’s cryptic mimicry can call attention to destruction of its South American habitat. The deforestation is due to farming of soybeans and sunflowers, he adds. “There are some places in eastern Paraguay where this bird once lived in Atlantic Forest where now it looks more like Kansas,” Robbins says. The Monell Molecular Laboratory and the Cullman Research Facility in the department of ornithology at the American Museum of Natural History supported this research. The Rudkin Scholarship provided support for senior author Benz during his time at University of Kansas.